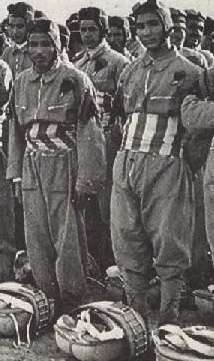 The Ascari del Cielo were the first paratroopers of the Italian armed forces. They all were born in Libya and with Arab-Berber ethnicity. They constituted the majority of the troops of the Battalion (later regiment) Fanti dell Aria, created in 1938, that fought in the Desert War during World War II. In spring 1938 in Italian Libya were created, from the royal colonial troops in Libya, two battalions of Ascari Libyan paratroopers, who -together with a battalion of Italian paratroopers created shortly after- became the 1st Parachute Regiment "Fanti dell'Aria". The word "ascari" indicated that they were colonial (and not Italian) troops. Indeed, on March 22, 1938, was officially set up a "Parachute Battalion" that consisted of about 300 native Libyans, under the orders of thirty Italian officers and NCOs. 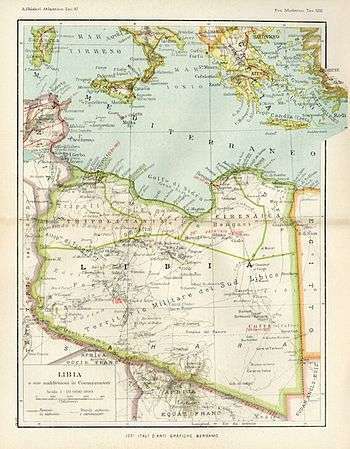 They were under the command of Lieutenant Colonel Goffredo Tonini and stationed at the airport of Castel Benito near Tripoli. After four weeks of training was launched simultaneously the entire battalion outside "Castel Benito airport" with the use of 24 three-engined Savoia-Marchetti SM.81, belonging to the 15º Stormo of the Italian Air Force. Another launch was done a few days later and carried out at night. Some casualties happened, like with Ugasci Mohamed Ben Ali who was the first paratrooper to die (twenty paratroopers died in exercise launches before World War II). They were noticed and appreciated even by Goering, when paraded in front of him in 1939. In summer 1940 the Ascari del Cielo were nicknamed "Diavoli neri" (Black devils) and numbered 500: they successfully attacked the British troops at the border between Libya and Egypt and forced them to withdraw. They were placed with the Gruppo Maletti at Sidi El Barrani (western Egypt). But in December 1940 they were nearly destroyed by the British offensive during Operation Compass. In January 1941 the remnants of the Ascari del Cielo were renamed Gruppo Mobile Tonini. During the first part of Jan. 1941 the battalion was moved to Derna and absorbed the remnants of the Gruppo Pancano and static units assigned to El Fteiah which totalled 370 men, 3 47/32mm guns, 4 75/27 guns, 12 20mm guns, 4 M11/39 tanks, 1 captured Humber armored car, 22 trucks and 12 motorcycles. The Libyan Battalion amounted to 430 at the time and an additional 50 men from the Parachute School. So, the total force comprised with the new units was 850 men strong and combining the weapons it brought the numbers to: 8 47/32mm guns, 8 Fiat M35 machineguns, 30 Breda M30 LMGs, and 12 20mm guns. This new comprised force was renamed Gruppo Mobile Tonini. In December 1942, the last of these paratroopers were captured in the advance of Montgomery in Libya after the battle of El Alamein.